Most restaurants tend to feature an in-your-face bar: at Lavelle, theirs gleams and at Lena it takes up half a floor. 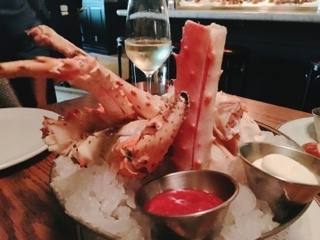 La Banane replaces theirs statement bar with a cold seafood station instead – oysters, shrimp, and crab are displayed prominently and as enticingly as any bottle of alcohol. In the end, it’s the Alaskan king crab ($52) we settled on, which takes a bit of work, but the crab’s salty tang is a succulent treat. In terms of condiments, the tried and true cocktail sauce was good, but the thick helping of crème fraiche needed an extra boost of herbs to stand up to the crab. 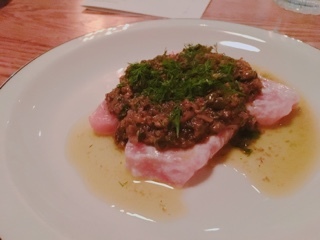 Covered with a thick paste of dill, brown butter, and caper tapenade, the topping on the albacore tuna ($16) was tasty but the thick layer excessive against the ratio of fish. 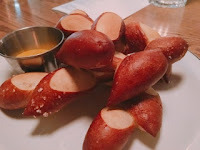 After scraping some off, the briny bite goes wonderfully with the delicate fish, the rest I used to dip pieces of complimentary pretzel bread into. 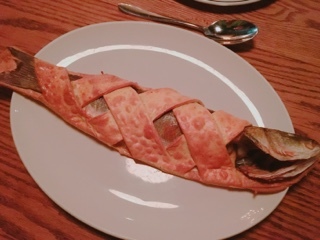 Having seen pictures of their Eurobass en croute ($32), an entire fish wrapped in a salt pastry, it’s a dish I wouldn’t miss. 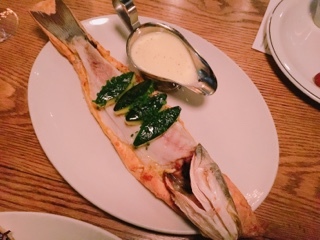 First presented fully intact, the fish is then whisked back to the kitchen to have the top layer of pastry and skin removed before being re-presented with an ample boat of tangy yuzu beurre blanc. Wow, can you taste the salt that permeates all the meat. Really, you don’t even need the citrusy butter sauce, although it was delicious. If only there weren’t strange orbs of zucchini dotting the fish. Personally, I’d imagine using zucchini ribbons to replace the lattice of pastry would look and taste better. 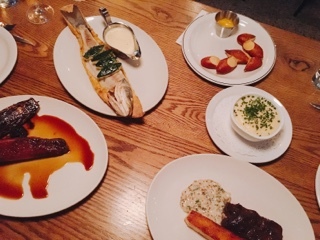 At La Banane, seafood dominates the menu. 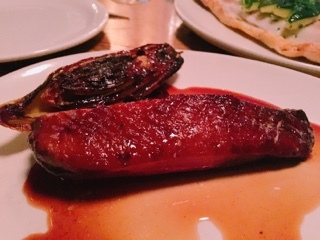 To balance out the sea, we opted for the duck breast ($28), a protein that the French does so well. Hence, when I cut through what looked like well rendered skin to find it soggy and chewy, the dish took a dive. Another taste with the bitter grilled endive didn’t improve my perception. 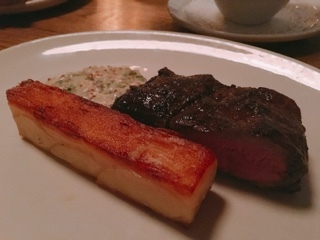 I’d stick with the flatiron steak ($25), the beef wonderfully tender and the soubise sauce incorporating an unexpected kick of grainy mustard that compliments the rich beef beautifully. 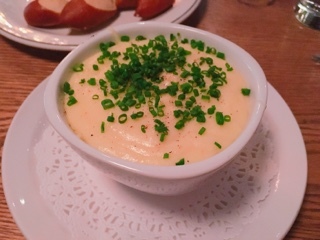 The bar of pommes Anna (think scalloped potatoes but using ultra-thin slices of potatoes and butter in lieu of cream) was perhaps the best part of the meal. Why isn’t this a side that you can get more of?! 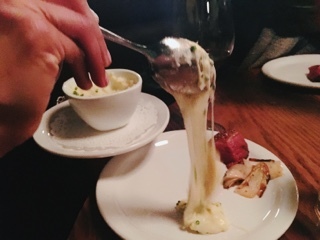 Rather, everyone seemed to get a pot of their pommes aligot ($12), the mashed potatoes incorporating so much mozzarella that its stringiness was taller than a supermodel’s legs. Think you can simply lift your spoon higher to get the cheesy potatoes out of the dish? Good luck. Indeed, the molten fondue nature of the aligot is impressive, but you really have to love cheese. Aside from the gooey mozzarella, there’s something stronger (gruyère and emmental perhaps), just a few spoons and I had to tap out. We couldn’t bring ourselves to shell out the $50 to try to Ziggy Stardust disco egg. 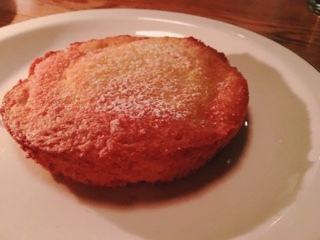 As a person who generally doesn’t like chocolate, after seeing the chocolate egg filled with truffles being presented at a neighbouring table, I’m glad we opted for the gateau à la banane ($12) instead. In spite of the cake looking like something a child makes in an Easy Bake oven, the flavours are spot on (a wonderful vanilla base with a creamy banana finish) and the slightly caramelized crust along the outside was fantastic. 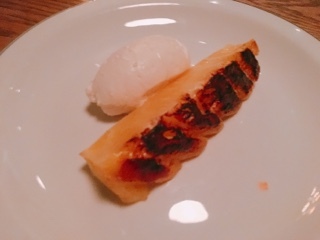 For an almost healthy dessert, La Banane offers a roasted ananas ($10), the pineapple encapsulated in a lovely sugary crust that turns the fruit into dessert. It really didn’t go with the tofu pudding, but I rather enjoyed the beany hit from the tofu, which could have been a touch sweeter. For the most part, La Banane’s food is good and the atmosphere is glitzy while still welcoming and comfortable. It’s their service that needs fine tuning. By no means are they unfriendly or inattentive, if anything, it might be too attentive. Working in pairs, rather than a person per section, it seems like everything gets repeated – being asked if I wanted water when there’s already a glass in front of me or wondering if I needed a drink while waiting for dining companions. Moreover, I understand the importance of ensuring people are happy with their food, but when a group’s deep in conversation and dishes are relatively clear, I’d rather not have someone interrupt at each course. If anything, a touch point in between the appetizer and main course and at the end of the meal would be sufficient. Perhaps I’m being nit-picky. After all, I’d rather enter a French restaurant without the Parisian snobbery. As for the overall experience, La Banane’s seafood is fresh and their sauces très délicieux, but all these best new restaurant accolades? I don’t get it. For me, they’re like a banana: dependable, but common.